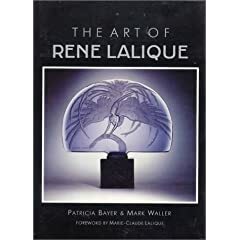 Rene Lalique became synonymous with French Art Nouveau decorative arts. Rene Lalique was born in 1860 and first began designing fine jewelry in Paris in 1881. Lalique pursued increasingly more innovative experimentation in glass commencing around 1883. Early works used the familiar "lost wax" technique by which the model is made in wax while a mold is formed around the model. Then, the wax is melted and molten glass is poured into the mold. 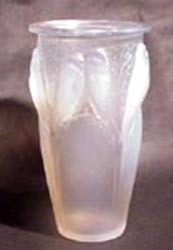 Lalique glass was made in this manner until approximately 1905 at which time the factory was redesigned for a larger production. As such, the individual uniqueness of each example of Lalique glass came to an end with the end of the one-time only molding technique around wax models. The success of this venture resulted in the opening of his own glassworks at Combs-la-Ville in 1909. During the Art Nouveau period, Lalique was well known for a wide variety of objects including perfume bottles, vases, inkwells, decorative boxes, and bookends. In 1921 a larger factory was established at Wingen-sur-Moder in Alsace-Lorraine. By the '30s, Rene Lalique was world renowned as the most important designer of his time. Lalique glass is lead based, either mold blown or pressed. Favored motifs during the Art Nouveau period were dancing nymphs, fish, dragonflies, and foliage. Characteristically the glass is crystal in combination with acid-etched relief. Later some items were made in as many as ten colors (red, amber, and green among them) and were occasionally accented with enameling. These colored pieces, especially those in, black, are highly prized by advanced collectors. 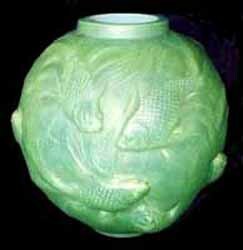 During the '20s and '30s, Lalique designed several vases and bowls reminiscent of American Indian art. 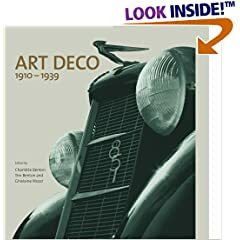 He also developed a line in the Art Deco style decorated with stylized birds, florals, and geometries. In addition to vases, clocks, automobile mascots, stemware, and bottles, many other useful objects were produced. While not well known, Lalique also experimented with bronze and other materials as well. Most glass was clear or opalescent glass and signed via engraving or in the mold "R. Lalique". The R. Lalique signature was only used until 1945 with the death of Rene. At that time, Rene Lalique's son Marc took over the company. Production of many pieces produced prior to 1945 ceased following Rene's death although some are still in production albeit with a different marking. The firm is still in operation today. Buy period R. Lalique, Loetz, Tiffany, and other art glass on the Collectics Fine Antiques and Glass pages, or search the entire site for great antiques, collectibles, and crafts for every collector! Sell or consign finer porcelain, china, bronze, and lamps at Collectics, where we earn our customers' trust everyday! Read about our top performing national consignment program for estate and personal collections.